From this tutorial you’ll learn how to utilize Animated Text JetElements module style for Elementor. Switch to the Style tab to view all the available style options. After Text — the text that goes after animated text passage. The style settings for these three blocks are similar. Color — here you can define the color of the text using color picker tool. Background Color — here you need to set the background color to increase text readability. Size — define the font size of the animated box content. Family — here you can set the font family for the content. Transform — here you can choose from the dropdown menu, if you want the content to be shown in uppercase, lowercase, capitalize or normal way. 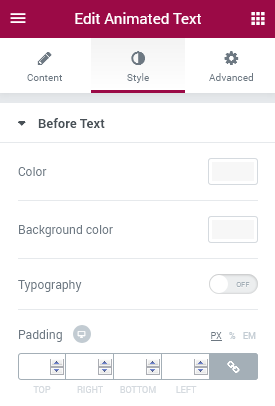 Line Height — in this field you can set the height of the content text lines. Alignment — here you can define the preferable content alignment. The title can be placed to the left, to the right, or remain centered.